By now you’ve heard your fill of Gordon Lightfoot’s wonderful but perhaps overplayed masterpiece, “The Wreck of the Edmund Fitzgerald.” The 42nd anniversary of the iron ore ship’s sinking in an early winter storm will be marked Nov. 10. The song’s iconic line “when the gales of November come early,” was on many lips this past weekend as a surprisingly powerful storm hit the big lake … in October no less. This new storm really was significant, as a scientific buoy observed the tallest wave in the recorded history of Lake Superior. 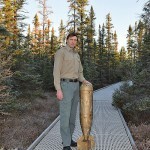 The buoy recorded the 28.8-foot wave just off Granite Island north of Marquette, Michigan. Now, highly accurate equipment like this has only been out on the lake for a few decades, but nevertheless, a lake wave taller than back country telephone poles should always merit attention. The gales of November indeed came early this year. 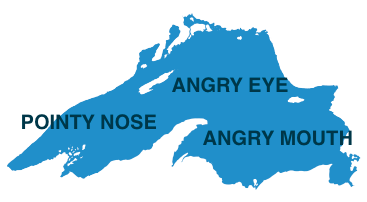 Read more on my theory that Lake Superior resembles an angry face. The city of Duluth now contends with damage to its iconic lake walk as attractions along the shore took a beating during Friday’s storm. Residents along the shore say it was the worst storm since 1985 at least. Only time will tell if this portends a rough winter on the world’s largest freshwater lake, a key shipping artery in the heart of North America. I’ll close by reminding folks of an episode of the Great Northern Radio Show we did from Duluth in 2016. In addition to a killer uptempo cover of “The Wreck of the Edmund Fitzgerald” we have a sketch about sea captains lamenting all the attention paid to “ships what sunk” when folks should appreciate the “ships what don’t sink.” Check it out.